ICJR REWIND: What Are the Top Considerations for the Table Used in a DAA THA? In an article originally published on February 5, 2018, Dr. Stephen J. Nelson and Dr. Lee E. Rubin of Yale University answer ICJR’s questions about the debate over the use of an orthopaedic traction table versus a regular OR table when performing a direct anterior approach total hip arthroplasty. ICJR: Surgeons continue to debate the value of using a special table when performing a direct anterior approach total hip arthroplasty. What factors should they weigh when deciding whether they need a special table? Stephen J. Nelson, MD: The supine patient position used in a direct anterior approach (DAA) total hip arthroplasty (THA) readily facilitates acetabular exposure and preparation, which allows accurate and consistent cup placement. On a standard table, elevation of the femur into the superficial part of the wound is primarily accomplished with a manual bone hook and a trochanteric retractor, with variable degrees of extension, adduction, and external rotation of the leg. Although a bone hook pulls the femur superiorly and laterally, a trochanteric retractor must be inserted over the lateral portion of the greater trochanter to elevate the proximal femur, using the skin and tensor muscle mass as a fulcrum. 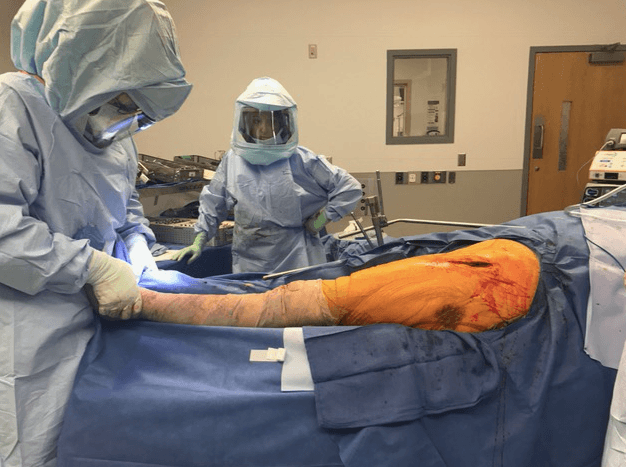 Lowering the distal end of the operating table to extend the femur can also be a helpful strategy, and if necessary, standard soft tissue releases can be performed as needed to facilitate ultimate exposure. When using an orthopedic traction table, the proximal femur may be exposed by dropping the limb spar to the floor, thereby hyperextending the hip. The table spars provide rotational and translational control, allowing for external rotation and adduction of the limb as desired, while maintaining the contralateral leg in neutral or a slightly flexed position. 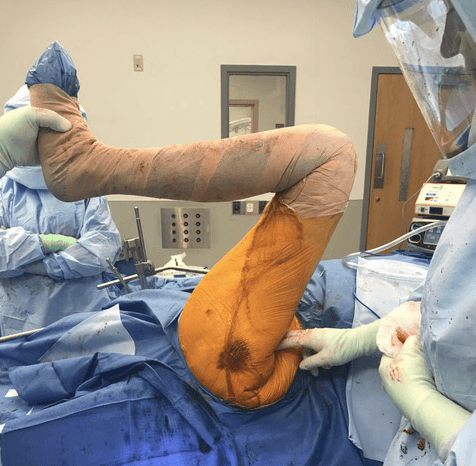 A femoral hook placed manually around the proximal femur and then attached to a hydraulic lift mechanism on the table allows the surgeon to set an appropriate tension to lift the femur as capsular releases are performed. In so doing, the orthopedic table acts as an operative assistant. Whichever table the surgeon uses, femoral exposure will require the same capsular releases. In a cadaveric study, release of the superior capsule permitted the greatest change in elevation of the proximal femur. The superior capsule of the hip is readily accessible during the DAA, regardless of operative table, and selection of both the table and the associated specialized instruments should be dictated by the surgeon’s preference. Many options for leg traction devices now exist, and most implant manufacturers produce DAA-specific instrument sets to give the surgeon appropriate tools for achieving direct visualization during the procedure, thus ensuring a safe and consistent DAA technique. ICJR: What are the pros and cons of using a special orthopaedic table versus a regular table? 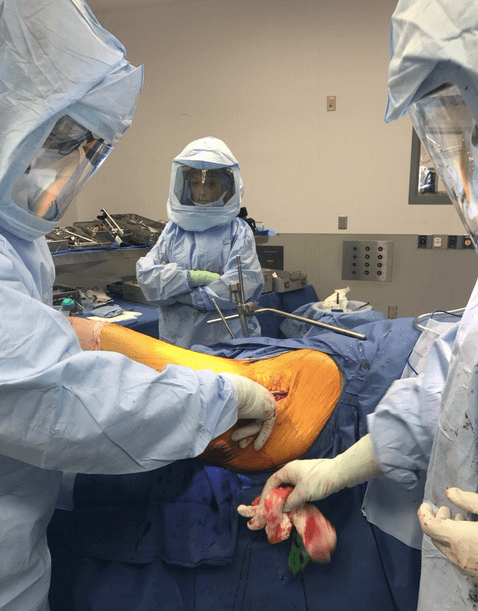 Lee E. Rubin, MD: One value of the traction table lies in its facilitation of femoral exposure, and as surgeons make the transition to the DAA, the table provides for consistent hydraulic assistance. The moving spar allows the surgeon to set and maintain hip rotation, extension, and elevation with minimal operator effort. Such assistance is particularly useful in muscular or obese patients, in whom access and preparation of the femoral canal can be especially difficult. Care must be taken to avoid creating an ankle or tibia fracture with the traction boot device, as well as to avoid iatrogenic proximal femur fracture from excessive force application with the hydraulic hook device. A second major reason surgeons choose an orthopaedic traction table is to facilitate intraoperative fluoroscopy. The orthopedic table is radiolucent and the pelvis remains flat, allowing for acquisition of fluoroscopic images. The surgeon must learn how best to obtain and interpret these intraoperative images, as significant distortion can occur from the effects of pelvic rotation, lumbosacral flexion (pelvic tilt), and parallax. In a recent study of primary DAA THA in 1599 patients using a traction table and fluoroscopy, Gosthe et al  demonstrated highly accurate cup positioning. In their subgroup of 506 obese patients, average inclination was 37.7 degrees, anteversion was 16.7 degrees, and 95% of cups were in the “safe zone,” including 95.7% for anteversion and 91.2% for both anteversion and abduction. When using a regular OR table, the surgeon may select a radiolucent bed to allow for utilization of fluoroscopy as needed in selected cases. The patient is positioned slightly more distal on the table and the fluoroscopy machine can be brought into the field just below the central table support with the receiver above the patient, allowing for real-time imaging of the pelvis or femur as necessary during the procedure without any need for traction application. Surgeons can consider a no-traction table technique as they become more familiar with the DAA. With the no-traction table technique, the entire leg is draped free and thus remains mobile for dynamic intraoperative examination. This allows for direct assessment of leg length, hip stability, and range of motion. Although a fair amount of stability is inherent in the DAA from preservation of critical muscular attachments around the hip, intraoperative assessment of hip stability and possible impingement is critical. Individual patient anatomy may necessitate more anteversion, offset, or length, which cannot be fully assessed while locked into the spars of an orthopedic table. To date, no single randomized trial has compared DAA total hips performed with or without an orthopedic traction table. Both DAA techniques have their individual merits, as noted in Table 1, and both methods are currently used for DAA at many institutions, including our own. A recent retrospective study evaluated the risk of intraoperative femur fracture (IFF) among 487 patients undergoing DAA THA by 2 experienced DAA surgeons at Brown University. The study compared IFF associated with traction table versus regular OR bed techniques and showed no statistically significant differences in the rate of IFF between the 2 groups (average 2.46%). There was a 0.4% overall incidence of IFF that resulted in change of management by requiring additional surgery. The 2 fractures requiring subsequent revision were both observed in the traction table group. With all factors considered, I prefer to forego the added expense, set up time, and logistical complexity associated with an orthopedic traction table. I also do not want to perform hip arthroplasty while wearing lead to mitigate occupational radiation exposure to myself and our team. Using a regular table and with the patient’s leg draped free, I can perform manual leg length assessment against the contralateral extremity (Figure 1) and also perform an intraoperative dynamic range of motion examination to assess hip stability and impingement in all planes (Figures 2 and 3). This can help prevent postoperative leg length discrepancy and reduce the risk of dislocation. Figure 1. Using a regular OR bed, the surgeon can directly assess operative leg length against the contralateral extremity with both legs placed into a neutral position. Figure 2. Full flexion of the operative extremity is performed with the leg draped free, with a manual feel for any possible anterior impingement. Figure 3. Full frog abduction is performed with the leg draped free, followed by complete internal and external rotation of the hip to ensure full ROM with no impingement or subluxation. Achieving these goals while accomplishing a balanced reconstruction of the soft tissues around the hip joint is critical. The surgeon’s ability to utilize manual methods of hip assessment with a regular table avoids the need for additional technologic burdens such as fluoroscopy, robotics, navigation, and other expensive supplemental technologies that have evolved primarily to accommodate the surgeon’s loss of manual control when a traction table is used for DAA THA. Although both methods can certainly achieve excellent results, it is clear that the selection of an orthopedic table will continue to be hotly debated, both now and in the future evolution of DAA total hip surgery. Stephen J. Nelson, MD, is a Clinical Instructor and Orthopaedic Chief Resident and Lee E. Rubin, MD, is Associate Professor and Chief of Adult Reconstruction at Yale University School of Medicine, Department of Orthopaedics & Rehabilitation, and Yale-New Haven Hospital in New Haven, Connecticut. Dr. Nelson has no disclosures relevant to this article. Dr. Rubin has disclosed that he has stocks or stock options in 3D Surgical, Inc., that he is a paid consultant for DePuy Synthes and DJ Orthopaedics, that he receives publishing royalties from Johns Hopkins University Press and SLACK Incorporated, and that he is an unpaid consultant for Thompson Surgical Instruments. Post ZD, Orozco F, Diaz-Ledezma C, Hozack WJ, Ong A. Direct Anterior Approach for Total Hip Arthroplasty: Indications, Technique, and Results. J Am Acad Orthop Surg. 2014;22:595–603. Light TR, Keggi KJ. Anterior approach to hip arthroplasty. Clin Orthop 1980;152:255. Matta JM1, Shahrdar C, Ferguson T. Single-incision anterior approach for total hip arthroplasty on an orthopaedic table. Clin Orthop Relat Res. 2005 Dec;441:115-24. Matsuura M1, Ohashi H, Okamoto Y, Inori F, Okajima Y. Elevation of the femur in THA through a direct anterior approach: cadaver and clinical studies. Clin Orthop Relat Res. 2010 Dec;468(12):3201-6. doi: 10.1007/s11999-010-1349-x. Gosthe RG, Suarez JC, McNamara CA, Calvo C, Patel PD. Fluoroscopically guided acetabular component positioning: does it reduce the risk of malpositioning in obese patients? Journal of Arthroplasty 2017; 32(10): 3052-55. Cohen EM, Vaughn JJ, Ritterman SA, Eisenson DL, Rubin LE. Intraoperative femur fracture risk during primary direct anterior approach cementless total hip arthroplasty with and without a fracture table. Journal of Arthroplasty 2017; 32(9): 2847-51.